What does it mean to be an optical company? Where do quartz materials come from? 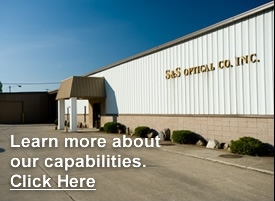 S & S Optical Company, Inc. is a leading manufacturer of commercial quality precision glass and quartz parts. 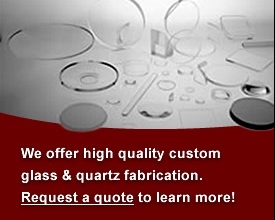 We design and fabricate custom glass parts and custom quartz parts using advanced machining equipment. We are an important resource for a wide range of industries needing everything from individual glass and quartz prototypes to short runs to production quantities. Our precision glass and quartz parts supply diverse manufacturers across the USA and around the world. Companies involved in military / defense, aerospace, marine, electro-optical sensors, medical and other industries rely on S & S Optical Company, Inc. for cover glass, internal parts, beam splitters and other glass and quartz precision parts. The glass and quartz parts are used in electronic tube, oceanographic, aerospace, aircraft, and optical detector applications such as face plates, lens covers, lighting windows, dome covers, gauge glass, light intensifiers, protective covers for machine vision and inspection systems, instrumentation glass, and radiation shielding glass. When your manufacturing or assembly process calls for precision glass and precision quartz part grinding and drilling, polishing, edging, CNC machining, milling, beveling, cutting, sawing, bending, coating, etching, laminating, S & S Optical can do it. We specialize in building prototypes for clients that need help in product development. We can customize a part for production. And we have the capacity for higher volume production runs of the final glass or quartz part. 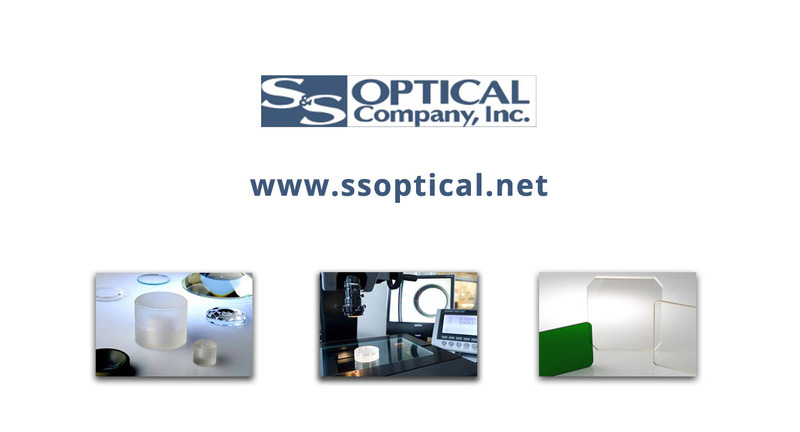 S & S Optical reconditions damaged glass and quartz parts that have become scratched, pitted, dulled, or clouded by use and wear to meet original specifications and tolerances. We look for surface defects less than 1/1000th of an inch. The quality level of the glass and quartz surfaces after our reconditioning is often better than the original glass and quartz material. We use a sophisticated method of ultrasonic glass and quartz parts washing and cleaning that leaves glass dust-free and clean. We use vapor and ultrasonic degreasing and cleaning to remove the toughest glass surface contaminants. At S & S Optical we outperform the competition. Each project starts with glass and quartz of the highest quality from the most reliable suppliers throughout the world. Using our machining technology and expertise we fabricate a precision glass or quartz part that is of the highest quality workmanship, clean and guaranteed to be 100% compliant with the original drawing requirements. In fact, our glass and quartz parts are so good right out of the box, they can be put directly into the just-in-time manufacturing process. Consistent, reliable, cost-effective are words customers use to describe S & S Optical because with the outstanding quality of our finished parts and on-time shipments we help to reduce our customers’ stocking inventory and save them the costs of returning parts. © 2017 S & S Optical Company, Inc.